Remember that raw phase I went through? Ya, i’m trying to forget it too. But sometimes I accidentally eat completely raw meals. This was one of those nights. I had read somewhere about using walnut “taco meat,”but the post I read it in used it to be raw. I immediately closed the window and moved on with my life. Now I know I have talked about my cravings before, but the weirdest habit of mine is craving things that I have never eaten. And well, that happened. I was craving this “raw taco meat” made from walnuts. On my way home from work that day I picked up some walnuts and guacamole to adorn the rest of the salad ingredients that I already had at home. Another element that I am going to bring into this salad is massaged kale. 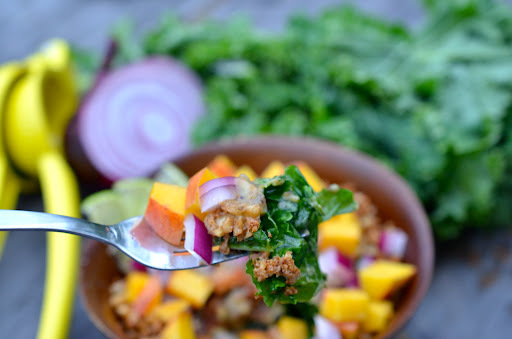 Every time I told someone I made a massaged kale salad, I was greeted with confused stares. But man oh man, everyone needs to hop on the massaged kale salad train. Basically, it is exactly what is sounds like: you coat it lightly with some olive oil, lemon juice (but tonight I used lime juice, since it was a taco salad), salt, and pepper and then get to massaging. You get the benefits of it being cooked almost, meaning it is much more palatable and you pre-break it down for your digestive system, but you also get the benefits of it being raw, meaning all of the precious nutrients are left untouched. And finally, I have also been playing a lot with using peaches in savory dishes. 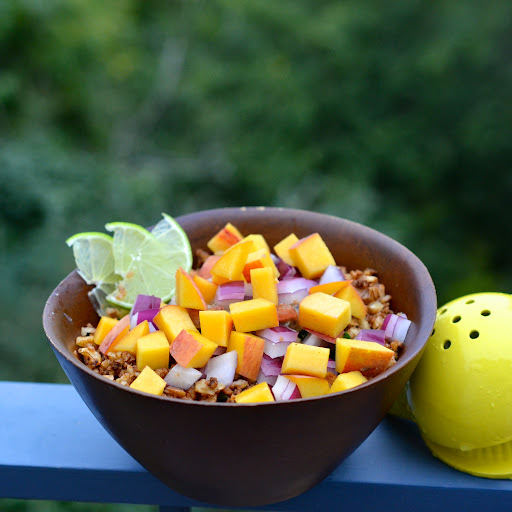 Peach or mango or pineapple salsa? Yes, please! I also had some peaches, so onto the salad they were going. Anyways, this raw taco salad of sorts was phenomenal and an absolute synch to throw together! Literally I was raving about the salad after every bite that I took. And then I made it for lunch each of the following days. It packs really well since you don’t have to worry about the kale wilting. The salad doesn’t need much of a dressing since the walnuts are flavor packed as well as the guacamole brings its Mexican goodness to the party. 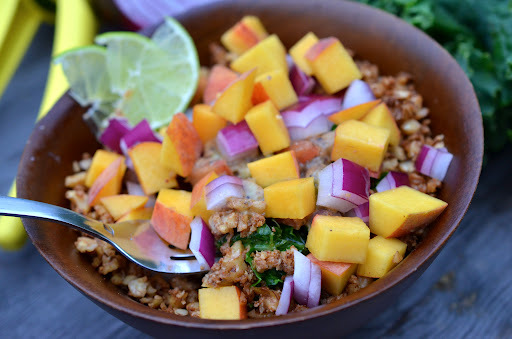 Raw food, you win this round… in the tastiest of ways. Place walnuts, spices, soy sauce, and lime juice in a food processor and process until the walnuts take on the consistency of taco meat. Toss kale in lime juice and olive oil with a few shakes of salt and pepper and then massage, as if you were kneading dough, until kale has wilted and taken on a supple texture. 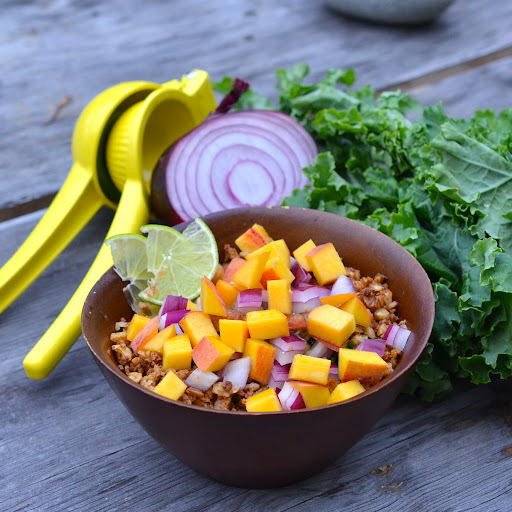 To assemble: Place kale in salad bowl, top with scoop of guacamole, sprinkle walnut taco meat around, top with diced peaches and red onion, and finish with a squeeze of fresh lime juice. 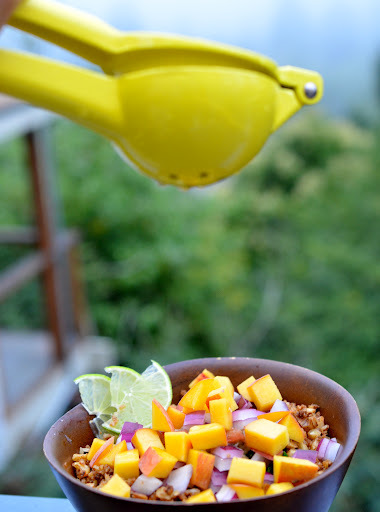 This entry was posted in Mexican, raw, Salad, Vegan and tagged kale, mexican, raw, salad, vegan on August 21, 2012 by Veggie with a Cause. Ok, the time has come. I have no flight reservations coming up, no trips, no big school events, etc. And I couldn’t be more excited! I had a few weeks of travel that all culminated with my birthday weekend this past weekend (Happy Birthday to me!). I had an amazing birthday where I felt immensely loved and taken care of, which is the best way to spend your birthday. From a new (zoom) lens from my amazing parents and a family reunion at some old stomping grounds in Michigan to a surprise birthday dinner at Chez Panisse and homemade birthday cakes in Berkeley from my amazing friends… it truly was a treat and I feel very blessed! But alas, time to get down to business around here, especially as summer produce is flooding our farmers markets and our gardens. When vegetables are grown organically and picked fresh and ripe, they are at their most nutritious. When farmed organically (without the use of pesticides, etc), the plants must rely on their natural defenses to stay alive. This means that they produce more protective compounds, which are then passed on to you when you eat it. Also, when they are at their ripest, it is when the plant is saying, “ok, i’m ready for my seeds to be spread, in return I will give you a nutrient packed treat!” So, I encourage you to take advantage of the produce that is out right now! Which brings me to this salad. 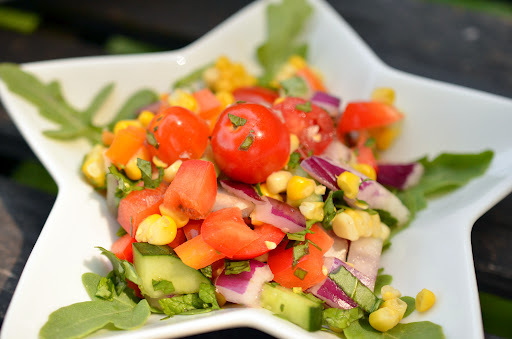 I was in Michigan, which for anyone who has visited there, has lots of corn… and a 100 degree day on the 5th of July was a perfect day for this corn salad that my mom has been waiting to try out. 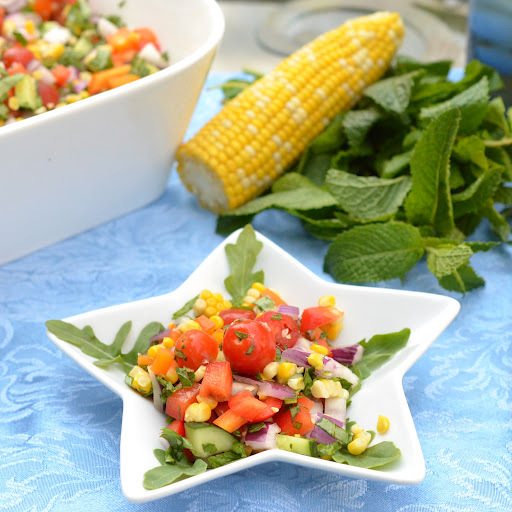 It is the perfect refreshing dish for a summer barbecue. We added some chickpeas to it to make it a filling main dish and served it at a little get together and it was enjoyed by all! I jazzed it up a bit with extra basil and some mint and it was incredibly palate pleasing and a great way to cool down on a hot day. Also, a big shout out to Elaine for providing the adorable star plate and the other props for this dish :-). Whisk together the vinegar, sugar, salt, and pepper, and set aside to allow the sugar to dissolve while preparing the rest of the salad. 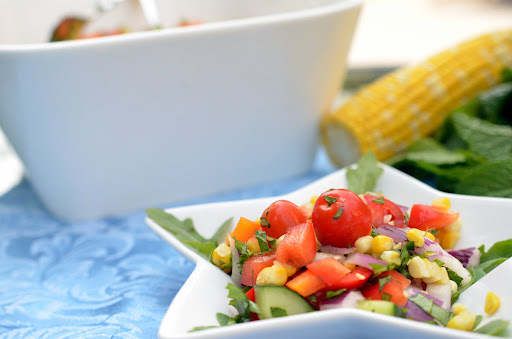 Toss together the fresh corn kernels with the fresh of the finely diced vegetables and dressing. At serving, gently fold in the arugula. Preferably with family and friends at a summer BBQ :-). This entry was posted in corn, dinner, Lunch, raw, Salad, Vegan and tagged corn, salad, summer, vegan on July 10, 2012 by Veggie with a Cause. I enjoy salads as much as the next vegetarian, I suppose. No, scratch that… I enjoy salads less than the average vegetarian (who I made up for the purpose of this argument). It isn’t so much that I dislike the idea of a salad, or raw vegetables… it’s just that salads are usually so uninspired. As in, if we are defining salad as “a bowl of raw vegetables tossed in oil and vinegar,” then count me in. But, if we are talking “bowl of limp iceberg lettuce with some hard tomatoes on top,” then count me out. Far out. As you can see, my issue is that most of the bowl is taken up by lettuce. I have nothing against lettuce… but I would rather have the space taken up by other vegetables. Everyone’s favorite parts of a salad are the dressing and the toppings, anyways, right? So why not make a salad that is ONLY toppings? The few years post college, I started doing just that. My idea of a salad was garden fresh tomatoes (my mom is a prolific tomato grower in the summer), cucumber, fresh corn, avocado, red onion, and Ken’s steakhouse italian dressing (yes, that is my favorite dressing and can be added to my odd list of favorites under fake maple syrup and above barbecue sauce). Delicious! So whenever I see a salad that is sans lettuce, it peaks my interest… which is exactly what this salad did. I made it for dinner one night last week and it was AMAZING. My word, it is so refreshing and flavorful. It has a super light dressing, but then the salad almost dresses itself as the tangerines burst in your mouth with every bite. 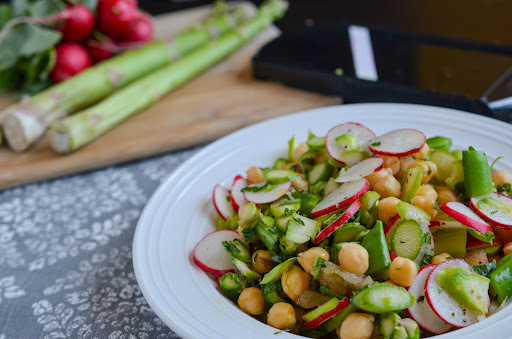 Well this weekend, when I was craving an equally refreshing salad (it has been pretty hot here lately), but had none of the ingredients left, I threw the following salad together. 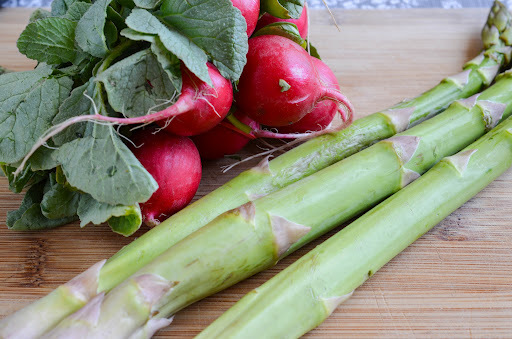 I had bought some radishes and asparagus, and knew I wanted to do something raw with the asparagus. And a little birdie once told me that radishes are delicious (but not as delicious as soup). AND I had a grapefruit that needed to be eaten. So it looked like I was on my way to a pretty delicious salad. And I was right (said with M emphasis)! It is crispy and crunchy and tangy and smooth. 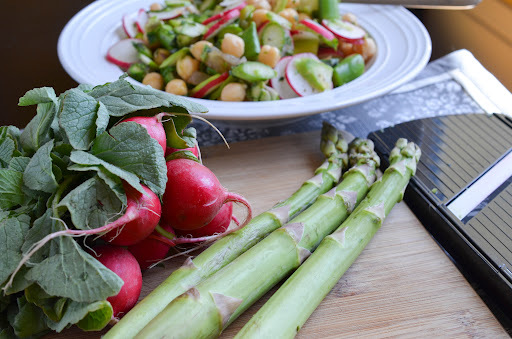 The radishes do their thing, and then the asparagus does its thang for the rest of the day. Lovely, just lovely. 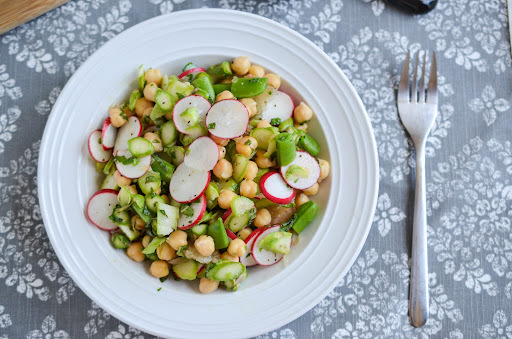 Slice the radishes and asparagus thinly using a mandolin. I cut the asparagus crosswise into medallions, but feel free to try ribbons if that is what you prefer. Toss everything together and season with salt and pepper. 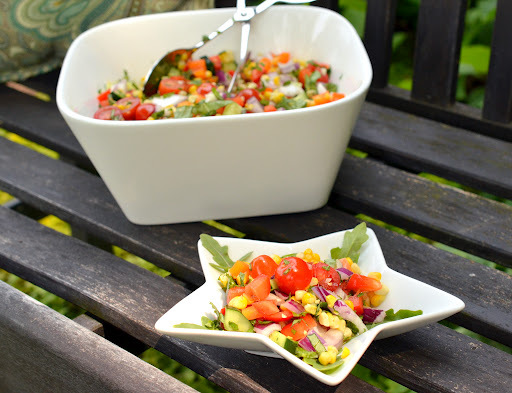 This entry was posted in dinner, Lunch, raw, Salad, Vegan on May 9, 2012 by Veggie with a Cause.